As a forerunner in the specialty of rheumatology, ARA has incorporated the use of ultrasound as a diagnostic tool as well as a procedural treatment modality for aspirations and injections. While the technology of ultrasound has been around for approximately 50 years, it has not been widely utilized by rheumatologists until recently. 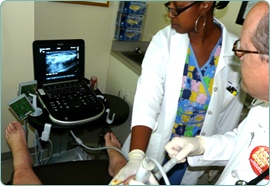 With ultrasound the physician can execute a procedure with more precision and more comfort to a patient. Medical ultrasound uses sound waves, not radiation, to visualize soft tissue structures such as muscles and tendons. It fully images any structure that both reflects sound waves and allows the passage of sound waves through it. Structures completely reflecting sound, like a bone, can only be seen on the surface. Bones reflect sound showing only surface characteristics and tendons and muscles allow the passage of sound waves allowing detail of their composition to be assessed. Ultrasound imaging can define the size and integrity of a soft tissue structure; and it allows the physician to observe tissues at a much higher magnification than other imaging modalities. This permits the interpreting physician to understand and observe normal and abnormal changes in tissue. Whereas MRI cannot be performed in patients who have a pacemaker, metallic vascular clips in the body or head or are claustrophobic, ultrasound presents no such challenges. The musculoskeletal system is particularly suited to images with ultrasound. Imaging with ultrasound not only allows an understanding of an organ’s normal and abnormal tissue, but it also affords the opportunity to observe the tissue in motion, so it can create a dynamic image in real time of these structures and of blood flow or inflammation. Our physicians have the opportunity “see” what is happening in the muscles, tendons and joints while that area is in motion. These unique qualities of ultrasound improve the care of our patients with musculoskeletal concerns. Diagnostic Ultrasound allows our physicians to observe the muscles, tendons, joint space and related soft tissues to look for early signs of arthritis or of other diseases in joints, cartilage and soft tissues. 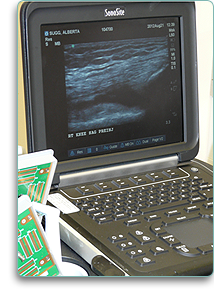 Ultrasound has been shown to be very effective to determine if there is “fluid” in the joint space. A special application detects small blood vessels that occur when there is inflammation in the joint lining or the muscle or the tendon insertion into the bone; this special application is called power Doppler. Ultrasound is also used to look at the surface of bone for subtle breaks in the surface of bone to help detect “stress fractures”. Ultrasound Guided Aspiration offers the physician the continuous direct visualization to maintain the needle in position for aspiration of fluid. Ultrasound Guided Joint Injections allow the physician continuous direct visualization while advancing the needle into the tissue. This contributes to accuracy and improved outcomes for the procedure. Patients enjoy the ability to observe and see this technology in process. Ultrasound Guidance of Aspiration and Injection of Joints and Tendon Sheaths allows our physicians to continuously visualize a needle while the needle is placed into the area of interest that requires treatment such as a joint, a tendon or a nerve. Ultrasound guidance enhances accuracy of the injection and improves the outcome from the injection. Patients enjoy this improved accuracy through less procedural pain, both during and after the injection. Patients also enjoy the opportunity to observe the ultrasound images and the technology in action, getting a better understanding of the nature of their problem and how it is treated. The addition of ultrasound into the practice of Rheumatology has greatly enhanced the experience for doctors and patients alike. By: Paul DeMarco, MD, FACP, FACR – Arthritis and Rheumatism Associates, P.C.